The Itty Bitty Kitty Committee: See, Charles! I Told You Everything was Going to Be Just Fine. See, Charles! I Told You Everything was Going to Be Just Fine. OH, wow. I got an update from Aimee and things are going even greater than I expected they might for dear Charles! Hooray!! The meeting between the boys went great. Viggo was fascinated by the new baby. We set carrier down and let them smell each other through the sides, then unpacked Charles into the Safe Room (bathroom). Viggo camped outside the Safe Room, asked lots of questions, and after 15 minutes of smelling under the door, attempted to dig his way in to free Charles from captivity. The carpet flew, paws (from both sides) tried to touch. We decided to let them meet whisker-to-whisker. They touched noses, Charles rubbed up against Viggo, and the rumpus began. No fussing, no hissing, no flattened ears! We kept a close watch on them to make sure Charles wasn't squished to a pulp. He definitely let Viggo know when he didn't want to be held down any longer. After a couple hours of play, it was time for bed. Charles cried a bit, then quieted down, and was quiet through the night. Viggo woke up at 5:30 and insisted Charles be sprung from kitten jail. I think that Viggo thinks that Charles is just for him! Charles often moves too quickly to find out exactly what he thinks. The boys played for a couple of hours. Viggo had Charles in a headlock for a good deal of time, then Charles would mew, Viggo would sit up, and Charles would bite Viggo on the leg or pop him on the tush, and run, or roll over, or corral a toy. Charles showed Viggo that the pull string on the lamp is actually a toy, and taunted Viggo into chasing him all over the apartment. Charles may be tiny, but he's fast and he is scooting into spaces that Viggo takes much longer to maneuver into. They both zonked out for a multiple-hour nap this afternoon. Viggo is so happy, and seems much cuddlier than usual. Charles is perky, absolutely confident in his new space, isn't afraid of anyone or anything, is purring constantly, is eating and drinking like a champ, and is using (and playing in) every litter box he can find. In keeping with our Scandinavian naming theme (Erik's father's side is Scandinavian), we deliberated and decided to re-name Charles as Finne. Finne can mean "fair" (he is very light and very pretty), but Finne can also mean "the wanderer". We thought the latter was particularly appropriate as he was supposed to be with another family first, and we are so so happy that he decided to wander over to our family instead. His middle name, depending on how we want to pronounce it, is Aamir or Amir. Aamir in Urdu is "civilized" and Amir is "prince"; I think we'll go with the latter, since he definitely will be the commander of our hearts, and who wants to be particularly civilized anyway? Viggo is just exhausted and is crashed out next to me. Charles/Finne Amir is snacking in the Safe Room/kitten jail and crawling on Erik's head. I haven't done much work today, but it's well worth the distraction to have this new little charmer in the family to keep us on our toes. We're so happy to have him! Thank you, thank you, thank you, Laurie! I've kept an open kitty travel crate under my desk, thinking that Viggo would be interested in napping in it, but he's never checked it out. This afternoon, Charles/Finne discovered it and crawled inside for a secluded nap. A little while later, I looked down to find Viggo also inside, curled up around Charles/Finne, and cleaning his new little friend. Heart melts! This is such wonderful news, Aimee! Thank you so much for sharing it. I couldn't be happier for our boy, and all of you!!! Eeeee! D'awww. <3 Sounds like he's got himself a buddy. Curious, though, what up with the kitten jail - is that when they're not home? Fantastic update. Wow, that transition went better than any I've experienced. Love Prince Charles' new name. May little Finne Amir have a wonderful and long life with his new family! @this space -- I assume that kitten jail is for isolation and protection. When introducing new kitties to each other (particularly when there is a size/age difference), it is best to not let them have total access to one another all hours of the day, even when you are home. One can't keep an eye on them all the time, and can never tell if affection and playfulness will turn into anger and fighting. The little one often needs time alone to rest until you are absolutely sure the kitties get along. Aw, I'm totally tearing up here. Sounds like Viggo and Finne are a best-buddy match made in Kitty Heaven. Oh! I didn't read carefully yesterday and thought Charles (I mean Finne) was an only child. I'm so glad he has Viggo! They sound like lovely little boys. We just love updates here!!! Hearing about Finne and Viggo and how they are learning about each other is very gratifying. Aimee and Erik are great cat parents. This sounds like a true love match!!! Hurray! this post is missing one very important bit: PICTURES! Aimee simply must report back on these best new buds with pictorial evidence. Oh yes, please, we must have a picture of the two of them curled around each other. I am so happy for Finne! I demand photos or it didn't happen! It's always a bit scary when they go off without a sibling, but this sounds like it worked out absolutely perfectly. Thank you so much for the update and yaaay for happy forever families! Thanks so much for the update, Laurie and Aimee! It is so wonderful to hear how much fun he is having with his new friend. And I agree, it would be amazing to have some pictures of these two together. Yay for another success story! I'm so glad to hear that Viggo and Finne are already happy together. It sounds like the absolute best situation for all involved. And I adore the photo of Pheona holding paws with Charles. Too cute! Now THIS made me tear up. Great news, but never expected it to be less. Thanks to all for the update. That is cute overload, once again! Congratulations, Charles Laurent/Finne Amir! And he gets to keep his "Prince" status! And, once again, the universe provided the perfect home for a kitten. I'm so glad that Finne and Viggo are getting along so well so quickly! I couldn't imagine a happier ending. Yay for wonderful kitty parents! HAPPY DANCES for Finne\Charles, Viggo and their humans! I always end up in awe of 'fate' when a kitten (or 2) has a placement that falls thru. It is a wonderful world! Hooray for Charles/Finne and Viggo! Happy tails. I join the chorus for PICTURES, PLEASE!! So absolutely perfect! I could not have imagined such a wonderful 'happily ever after' story! And yes, count me as one voting for pictures of the two brothers! Im sorry to say this but i Swedish "Finne" means pimple, it can also be a person from Finland (but not in a derogatory way). Swedish, Norweigan and Danish is very much alike but Finish is a whole diffrent language and more related to the Hungarian language. But in the most parts of Scandinavia "Finne" means pimple or a person from Finland. I don't say this to be mean, I just want you al to know so the cat can get a more apropriate name. Maybe Elden ( the fire), Glöden (the glow), Solen (the sun), Blixten (The lightning), Apelsin (Orange, the fruit), Bärnsten (Amber). Or a common swedish cat name like Tusse, Misse or Pelle. Or a Asa-god like Balder, Thor, Loke or Oden! "Finne" means "To find" In norweigan and "Fin" (like the one one the fish) in Danish. You humans can call a cat whatever you want, because the cat will never respond unless it feels like it. Or if it is kitty-treat snack time And according to t.s.eliot, they all have secret REAL names that humans cannot pronounce anyway. And I meant to add, Viggo sounds like quite the amusing fellow! Asking questions and trying to dig Charles out of jail. Splendid! Such good news and a chance to learn a teensy bit about language differences at the same time! Sounds like a perfect match - so happy everything worked out for this little prince! Hurray!! Wonderful updates! So glad Charles/Finn has such a great home! I am so glad to find you. I have seen your photostream on Flickr (I'm sure it's yours) and I have been deeply in love with all of these babies since. How cute! Viggo loves his new friend! These success stories and updates make my day and why I love coming here. 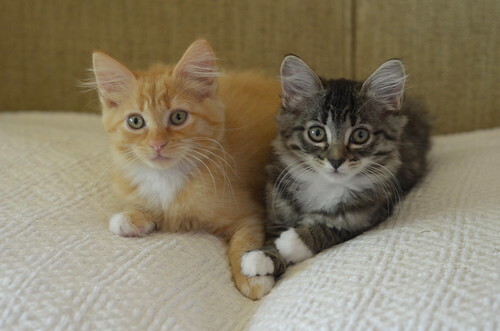 The kittens are cute and all but what's really awesome is knowing they're in good homes for life. perfect! almost unbelievable. and yes, i want pictures, too! what a lovely update! Now THAT is how to end a furry tale! I mean tail! Lovely news! Here's hoping Finne and Viggo have a long & happy life!